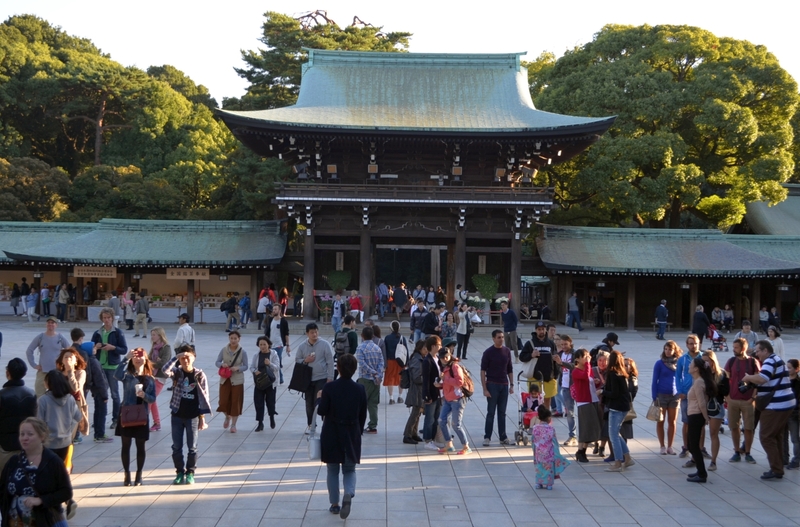 When you travel to Tokyo, it’s hard not to fall back on certain well-worn travel clichés to describe the experience. Whether it’s the ever-present pull you see and feel between ancient Japanese tradition and the realities of modernity, the experience of walking through chaotic cityscapes then finding yourself in a serene Shinto shrine, or the sensation of sitting down to a meal completely foreign to you but at the same time feeling like you’re home, all I know is that after numerous once-in-a-lifetime meals, several laser-emitting robots and one urban kimono wandering later, my trip to Tokyo will be hard to forget. Before us a small wedding procession snaked its way along the perimeter of the shrine in Tokyo as white-gloved guards in black suits herded the many hundreds of onlookers off to the side to provide way for the group. Behind the wedding party the towering Shinto shrine Meiji Jingu cast a long shadow over the pavilion where we stood, and the stoic couple — the groom clad in black and the bride in a white kimono and wearing the traditional wedding headgear known as the watabōshi — looked impassively forward as the Shinto priest bowed before them, completing a ceremony that dates its roots back thousands of years. The group then proceeded through the nearby torii (gate) and the crowd quickly dispersed back into somewhat organized chaos, taking selfies in front of the shrine and heading to the nearby souvenir booths. 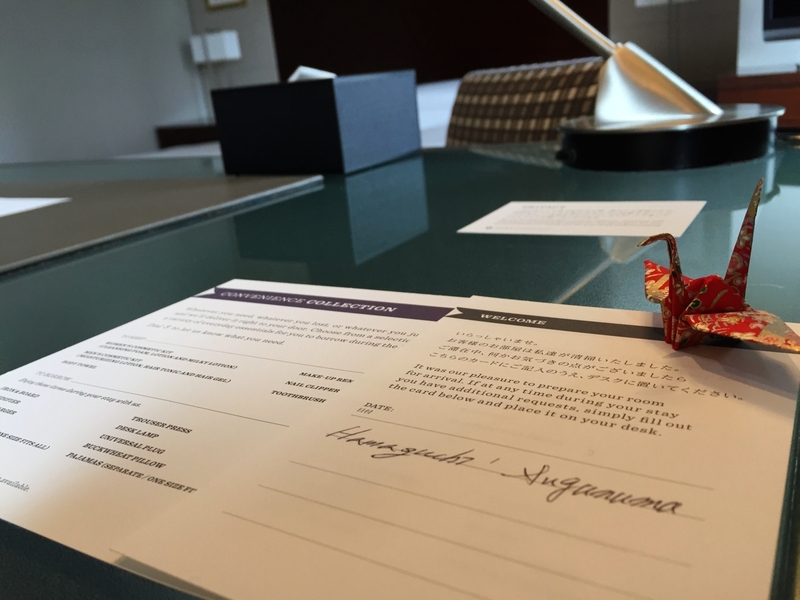 And thus concluded our introduction to Japan. We had just landed in the country the night before and it was now late afternoon on a Saturday during the last week of October, which according to my questionable math skills, meant that back in New York it was around the time I was normally entering into the second stage of REM sleep, and I would have been hours away from being able to comprehend such basic questions such as how to convert 730 yen into U.S. dollars or why I felt so relaxed and peaceful in a city that is at the center of the world’s largest metropolitan area (37.8 million people at last count). This was a feeling I was to have many times during my week-long stay here in Japan which included stops in Tokyo and Iwate Prefecture to the north. A country that is so routinely associated with bright lights, crowded streets and manic crowds by those of us who have never been is more often anything but. I was regularly reminded of this, including when I was walking down the crowded streets of Tokyo and the lines of people around us would shift to the left to make way for those walking in the other direction, or when we would step into a crowded subway car and sit down on a plush seat and listen to the eerie silence of hundreds of commuters quietly making their way to work as if they were sitting through a piano recital, respecting each others’ need to sleep, read or enjoy a few minutes of peace without interruption. New York City this was not. The night before we had arrived from New York via ANA (All Nippon Airways), which offers daily direct flights from JFK to Narita, Tokyo’s largest airport located about an hour outside of the city. Of course, this being a Japanese airline, the difference in service was immediately apparent. From the overly courteous flights attendants handing out hot towels upon seating to the peaceful mood that pervaded the entire overnight flight, it would be difficult to ask for a better way to be hurled across 14 times zones over a 12 1/2-hour time period. 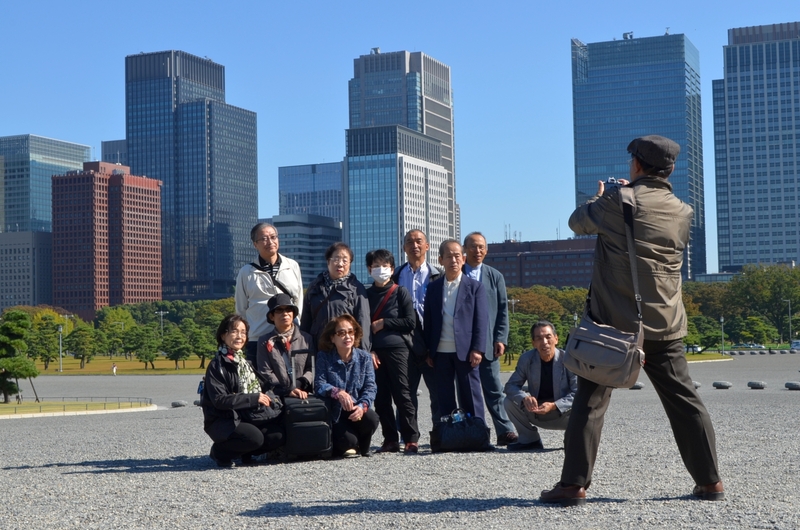 After arriving a good half-hour early, we grabbed our bags and headed to the nearby bus pickup line where our luggage was immediately loaded and we were on our way for the quick 60-minute trip to the Hyatt Regency near Shinjuku station in the center of Tokyo. 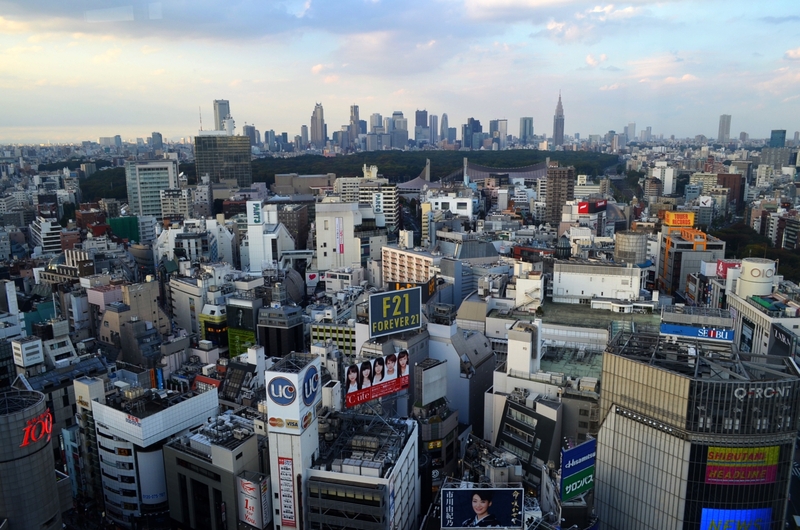 Located on the northeastern edge of Shinjuku Central Park, the Hyatt Regency Tokyo offers amazing views over the park and off into the distance across greater Tokyo. Just minutes from Shinjuku Station — the world’s busiest train station with over 1,000,000 commuters and travelers using it on a daily basis — the hotel is a quiet oasis featuring over 700 rooms, a rooftop spa facility, indoor pool, access to the Tokyo subway system just below it, and perhaps most welcoming, one of the best breakfast buffets I’ve ever encountered served daily from their all-day restaurant, Caffè. We also were given the chance to stay in a Regency Club room, which besides such amazing Japanese hotel amenities such as a kimono, a centralized light control system and perhaps the most complex but satisfying digital toilet anyone could ask for, it also provided access to the Regency Club high atop the hotel with sweeping views of the city and complimentary snacks and drinks throughout the day. The locals we met were even familiar with the property and knew of its reputation, and I couldn’t have asked for a better place to call home while in Tokyo. 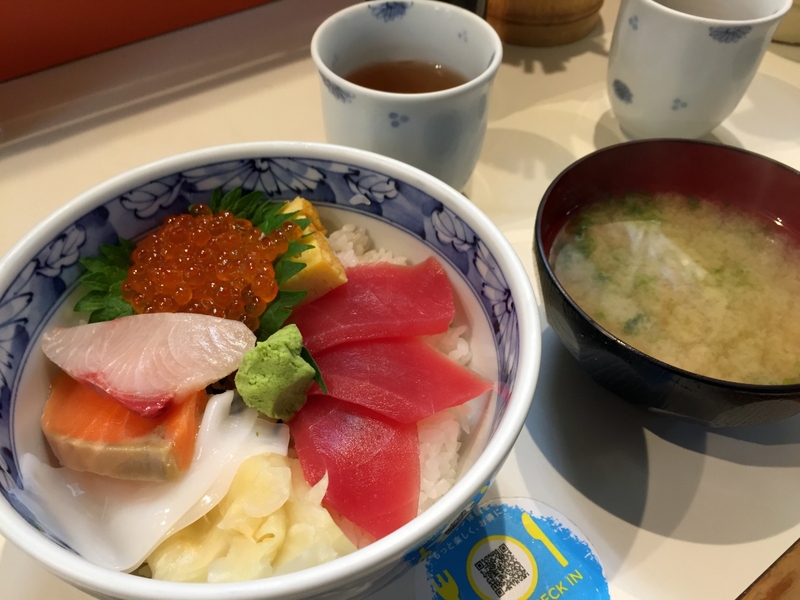 On our first full day out and about Tokyo, we decided to forgo the hotel breakfast buffet and start the day the Tokyo-way: with Kaisen Don (a large bowl of assorted sashimi over rice), and what better place to experience this then the famed Tsukiji Fish Market, the epicenter of the fish trade that is central to the city’s love of seafood? Home to a 2,000-ton fish trading operation involving over $15 million dollars of fishy trade daily, it’s no surprise the market is one of the best places in the city to get a simple, fresh seafood meal. Comprised of the Inner Market and Outer Market, the Inner Market is where the auction and trading actually happens (and where you need to plan on getting in line sometime in the middle of the night to get tickets to access the premises), and the Outer Market just down the street, which is home to hundreds of different vendors and food stalls where you can buy goods or grab a counter seat and order breakfast like we did at one of the many food stalls. With a healthy mix of both locals and curious Westerners sitting on both sides of us, the very serious and dedicated chefs quickly prepared our breakfast (salmon, squid, tuna, tofu, ikura) with a side of miso soup, and placed it in front of us on a tray with a pot of hot tea to wash it all down. After a winding stroll through the vendor market outside, we headed to the center of Ginza, the neighborhood known as “Tokyo’s Fifth Avenue,” and home to some of the city’s priciest stores and real estate (at one point during the height of the country’s real estate bubble in the late 1980’s, one square meter in Ginza was worth $200,000). Here our group signed up to experience a traditional tea ceremony with Ginza Chazen, a tea ceremony that began with us donning traditional kimonos at a nearby shop then walking down the street to the site of the tea ceremony, an experience I would have thought would have garnered a few more curious sideward glances from people passing us on the street. I credit my natural samurai-like demeanor for fitting right in and appearing authentic in traditional garb. Upon arrival we were given a quick introduction by the host about the history and importance of the tea ceremony (or Chanoyu), then we ducked our heads and crawled through the small entranceway to the tea room, the nijiriguchi, and sat on tatami mats. Traditionally, the tea ceremony has its roots in Zen Buddhism and dates back to the 9th Century where its practice was brought over from China. 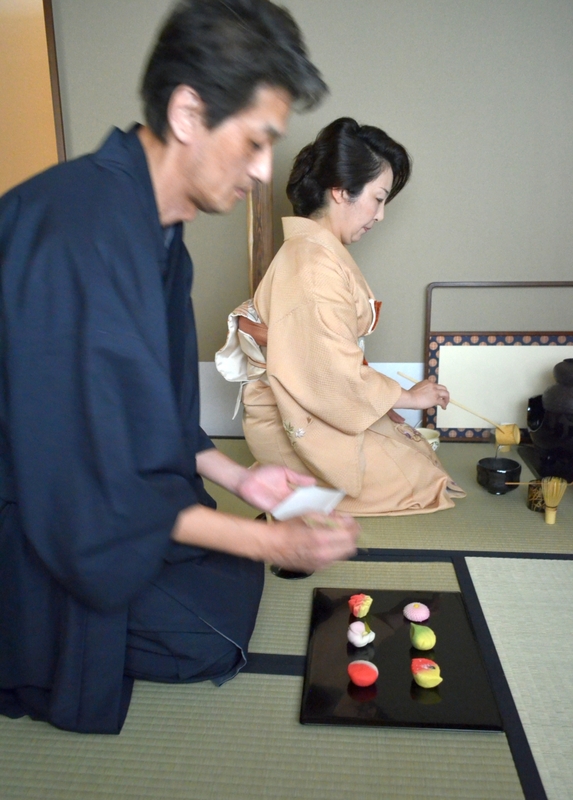 The ceremony itself is not only a social ceremony to welcome guests, but it also serves as a democratizing event where participants of all importance enter through the same humble entryway and consume Japanese green tea known as matcha along with a small sweet snack. Our host brought out the matcha tea as we sat along the edge of the small room and prepared cups for us, then explained to us the intricacies of drinking the tea, including how to pick up the cup, how to rotate it and drink from its edge, then finally how to purify the cup afterwards by wiping it clean with a cloth then placing it properly back in front of you. In keeping with the traditional theme of the day, we headed north to the quiet neighborhood of Kagurazaka, one of Tokyo’s quaintest neighborhoods full of traditional cobblestoned alleyways and hole-in-the wall upscale bars and restaurants. At the beginning of the Edo Period, this area was home to the city’s geisha culture, home to numerous homes and restaurants where geishas would entertain the male guests and where many a clandestine affair was said to have occurred in the private nooks and crannies of the maze-like pathways. 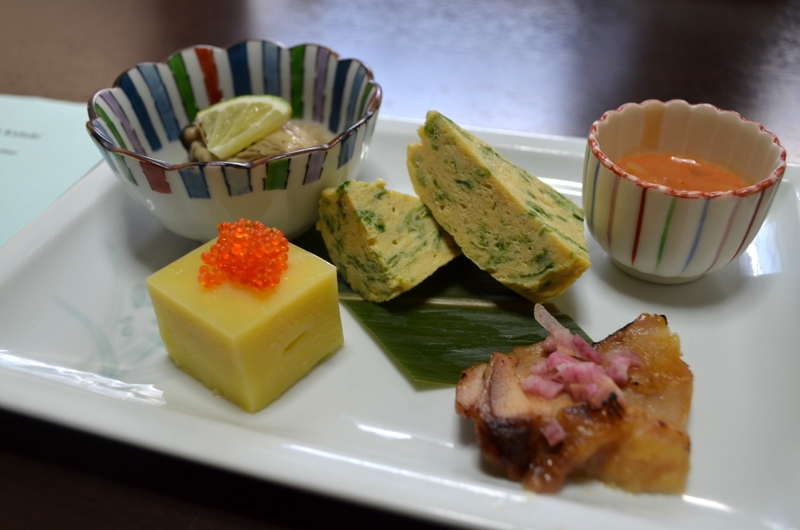 On one of those side streets down the block from Zenkoku-ji Temple, we stopped in for lunch at Kagurazaka Shizuku, where we were ushered into a small dining room and presented with a multi-course meal (kaiseki) over the next hour. Our meal began with a corn-flavored tofu to keep up with the season and a seaweed-infused omelette for an appetizer, followed by sashimi (spanish mackerel, sea bream), and our main dish: thin strips of duck served Teppanyaki-style, which meant we grilled it ourselves on a small skillet set up in front of us. Just to make sure we were plenty full by the time we left, our meal concluded with a variety of tempura, inaniwa udon and green tea ice cream. One of the more convenient parts about getting around Tokyo is the number of ways one can actually do this, including subways, express trains, white-gloved taxi drivers decked out in formal suits (you’re not going to see that in most of the world) and bike rental. To get from one end of the city to the other, I would suggest ditching the bike and saving yourself the hassle of buying a pass every time you were going somewhere and picking up a PASMO card like we did. At any station, for a small deposit you can pick up a PASMO card, which is a rechargeable contactless plastic card utilizing RFID technology which allows you to pay for entering a subway or train by simply placing the card near the reader at the gate. The best part about the PASMO, and dangerously its most addictive utility, is the fact the PASMO acts as payment at thousands of different locations, including restaurants, stores, coffee shops and vending machines. Instead of hassling with change and wasting time trying to figure out how much each ride is going to cost, do yourself a favor and pick up a PASMO and save yourself lots of time and hassle. 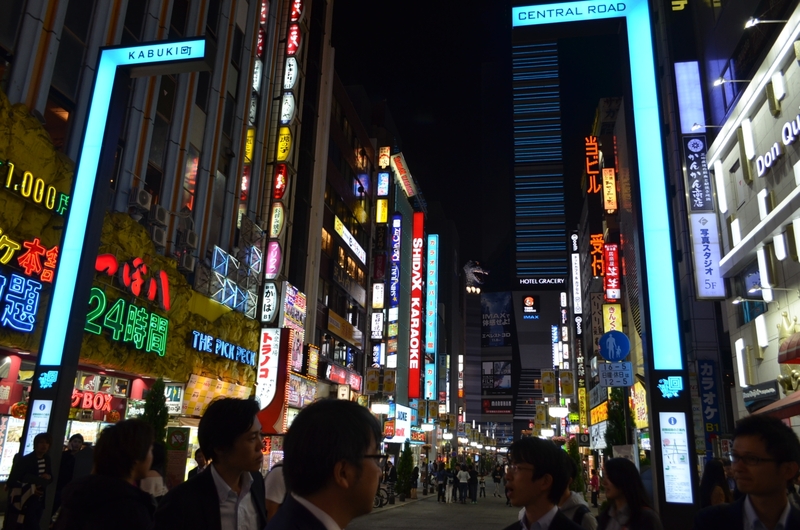 With PASMO in hand, we hopped on the subway (known as the Tokyo Metro — look for the distinctive blue “M” outside to find a station), and headed to one of the world’s most famous crossways, Shibuya Crossing. This multi-path street crossing and the towering advertisements on the buildings surrounding Shibuya Station is what Times Square is to Tokyo: frenetic, hypnotic, chaotic, somewhat aggravating after a few minutes, but a must-see for any visitor to the city. After stopping by to see the famous statue of Hachikō (the statue dedicated to the loyal Akita that used to greet its owner after work outside of the station every day and continued to do so for nine years after his owner died), we made a few adventurous crosses then ditched the masses and headed to the top of nearby Excel Hotel Tokyo where its several restaurants and bars 25 floors up provide some of the best views of the city and of Shibuya Crossing below. 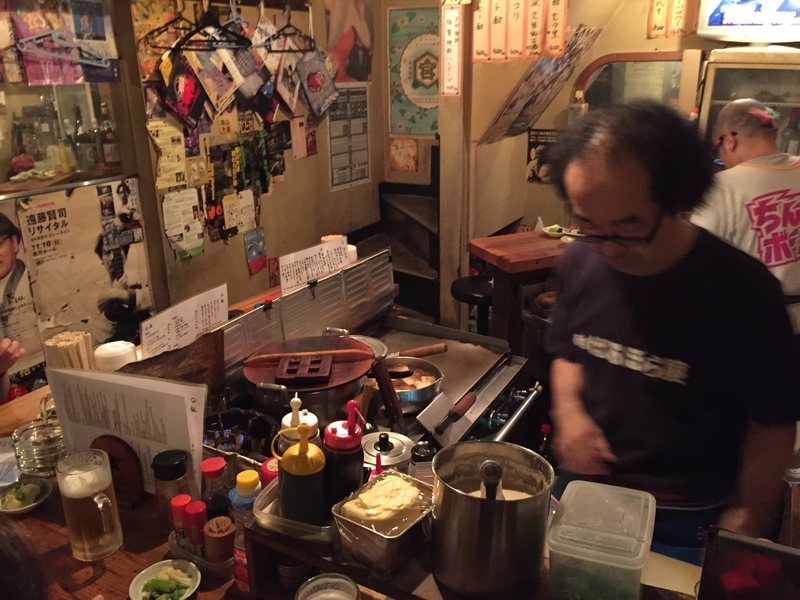 Making our way back up to Shinjuku, we decided to grab dinner at one of many dozen Izakayas situated in the small enclave of tiny alleyways and small, two-storey wood buildings that call Golden Gai home. A throwback to pre-war Tokyo, this low-key neighborhood is a far cry from the bright lights and towering buildings around the corner. Here, along the dimly-lit pathways and overhead power lines snaking across each other, you will find numerous bars and restaurants whose closet-like size can barely fit more than a large group, but whose intimacy with their chefs and owners across the counter offer a unique way to kick back a Sapporo or five and have an inexpensive meal quickly prepared before you. We chose a local favorite, Baruboraya, with its faded concert flyers covering the walls and its friendly chef and bartender shoveling food and drinks our way as fast as we could order them. After several Japanese lagers and dishes including curried udon, grilled edamame, assorted sashimi and okonomiyaki all shared family-style, we squeezed our way outside and finished up the night in classic Shinjuku style: a visit to the famed Robot Restaurant. 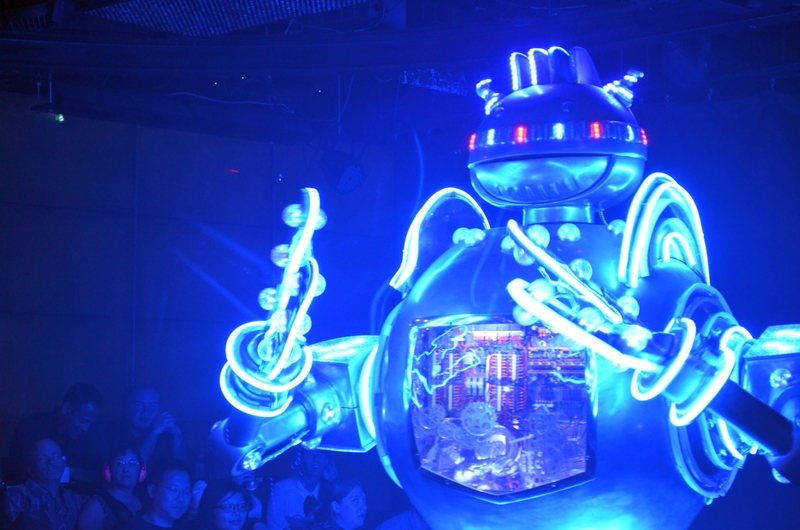 Little visited by locals, but gracing the Facebook pages and Twitter feeds of Western tourists since its opening, Robot Restaurant is a hallucinogen-inspired dinner show part-Manga and part Liberace, with a bit of Mad Max thrown into the mix. 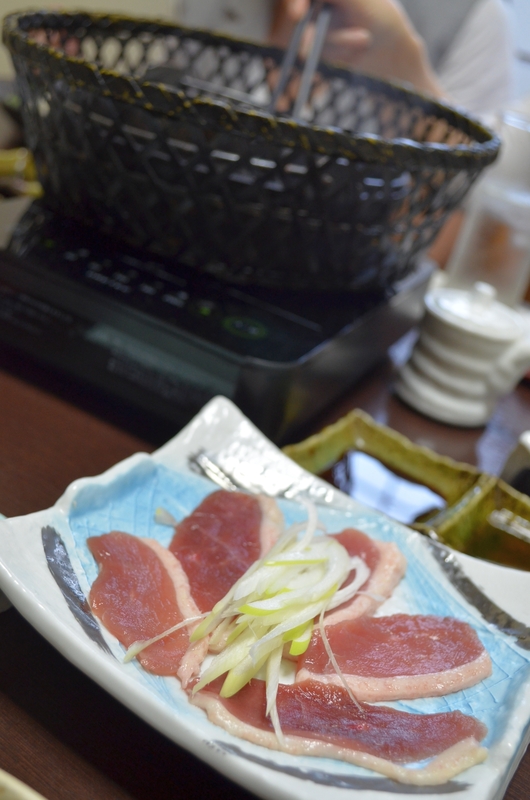 Since opening in 2013, the restaurant has become a favorite for visitors to the city looking for an only-in-Tokyo experience (and, what seemed to be the common theme from everyone I spoke to there, just something you need to do at least once while in town). The restaurant itself is less restaurant and more Vegas-style performance, with a several “acts” performed while bento-style food is served. The show’s narrative itself is hard to follow, but each performance shares a common theme of brightly-lit costumes, robotics, scantily clad 20-something Japanese women, lasers and a throbbing musical soundtrack that will leave you in a daze an hour and a half later as you stumble onto the busy streets outside. After the show concluded, we hailed a cab and the driver pushed a button, automatically opening the back door, and we quickly found ourselves back in an oasis of solitude, the bright lights of the city’s signs reflecting past us on the car’s windows as we slipped away, back into the quiet area we were calling home. The excitement, noise and bright stimuli fading into memory, close at hand, but gone for the evening.